What should we know about Mahathir and Petronas? 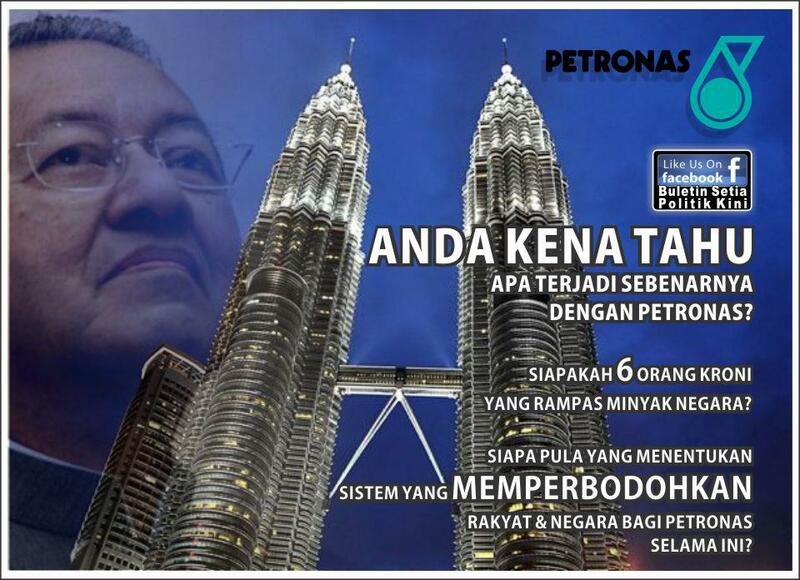 PETRONAS money is Mahathir’s cash cow. Don’t believe; let PKR win so that the books can be open wide. Nobody allow to spent a single sen without the approval of Mahathir Kutty. Mahathir Kutty thinks he can carry the oil money to the next world. Before that the Rakyat will teach him a lesson that his parents failed to do. – It’s High Time To Review The PETRONAS Oil Royalty Agreements! PETRONAS which i believe most people are not aware of. Had PETRONAS been managed so badly that despite it being the nation’s biggest money earner, it is now facing the possibility of going bust (bankrupt)? a secretive organisation worse that a “kongsi gelap”. The PETRONAS agreements have been classified secret. Why? What clauses are in the agreement are so sensitive that nobody should know? This secrecy also includes the secrecy of PETRONAS detailed annual report which is shielded from public eyes and scrutiny, making it an organization without public accountability. PETRONAS is therefore more a sole proprietorship completely and secretively owned by the prime minister then a public government owned company! What is so secretive that it cannot be revealed and only the prime minister has total complete knowledge? Are we supposed to trust the prime minister and have faith in him after all the scandals, “curi duit rakyat” cases and fiascos continuing to hit us? agents are the ones reaping the benefits and huge profits in the oil price hikes. – who are these people – the lucky 6 option holders? – why are they there in the first place? – why are they so lucky over the other 28 million malaysians? – why am i not chosen? – why and who created such a stupid system for PETRONAS? Are these people in fact cronies representing certain people with private interests and personal private pockets? PETRONAS is losing our rakyat’s money faster than bingo? And do you now understand why the BN government keeps crying and wailing about being unable to subsidise the petrol prices any longer and why idris jala is weeping that the country is going bankrupt in a couple of years? Any idiot can tell you that no business can sustain like this – sell cheap because PETRONAS is tied to the age old low price for 20-30 years and buy back at absolute sky high market price – without going bankrupt faster than bingo! By business logic, PETRONAS should be highly profitable if they sell our high grade malaysian crude at market price (higher than arabian crude because our crude is high quality with low sulphur), and buy back arabian crude at market price (lower than our selling price). Why and how we got ourselves into this dire straits deserve a white paper or a royal commission of inquiry… And worse why the idiots responsible are not letting go after raking billions in profits since 1974? Why so greedy? Do they want to continue milking the poor rakyat until the end of the world? Only 20% of PETRONAS’s supply is sold through direct open bidding. Thus, PETRONAS is sadly not maximising its revenue and profits by dealing directly with the open world market. Instead it has been incurring incalculable losses for the nation and for the people. How much this monstrous loss is, we will never know… Until we get an honest prime minister or until we topple the BN government. The members of parliament and the state governments should boldly raise this very important issue in parliament or directly with the federal government for the benefit of the oil-producing states and the people. The BN MPS seem to be quite hopeless in this respect, cowering in fear, whimpering in their little corners and not even daring to utter the word “oil” or “PETRONAS”… Such useless people should be removed and voted out of office. They are supposed to be representatives of the people or rakyat, and are supposed to keep the government in check to ensure the interests of the people are taken care of. Instead, these useless MPS are supporting the plundering or are part of the plundering and robbing, on top of demands for contracts and more contracts! They take care of their own pockets as first priority, and the pockets of their cronies as second priority. The people and rakyat???? They won’t even bat an eyelid! There is a window of opportunity for all of us to demand a review of the PETRONAS agreements and to make PETRONAS open and transparent. We should also demand that the system of having the 6 option holders be abolished. A new system should be created in which the three oil-producing states are in control of the marketing arm of PETRONAS, to make PETRONAS trade directly in the world market with the aim of maximising revenue for the benefit of the nation. Obviously, PETRONAS is a huge business organisation which is not accountable, secretive, and open to a lot of abuses by the prime minister himself, including the decision to use its revenue to bail out various individuals who faced bankruptcy in the midst of the asian economic crisis 13 years ago. If the federal government truly wants to be responsible and accountable to the people as it claims it wants to be, they should have long time ago proved their sincerity for excellent governance by opening up full public transparency accounting into PETRONAS’s revenue and expenses!!! We’ll love to hear from you. The Dictator could probably take the crown of being one of thecrudest comedy movies of 2012. Indie Movies may not be talented to perform different parts, but as these windows shrink and threaten our industry’s future, it is not necessary.